Peter Sprague is the ultimate professional: When leading his various combos, the Encinitas-based jazz guitarist consistently deflects the spotlight to the rest of the band. While not arguing with that approach, for it's resulted in some stunningly lovely recordings and a lifetime of great live shows, getting to hear Sprague display some of his own wizardry is a real treat. A new solo guitar recording on his own SBE ("Strivin' to Break Even") Records reminds anew just how obscenely talented he is. Whether playing some of his own sun-soaked beach jazz or a Beatles cover, whether tackling Pat Metheny's modern jazz or Gershwin's all-American approach, or whether paying homage to legends John Coltrane, Antonio Carlos Jobim and Frederic Chopin (! 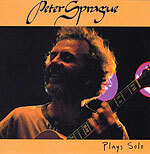 ), Sprague's playing shows that his technical proficiency is leavened and warmed by his well-rounded background on acoustic guitar. From rock to Romantic to, of course, jazz, Sprague plays to the material's style, bending his considerable talent to meet the song's strengths. It is a remarkable performance.